Raw Data has already been causing quite a buzz even in its Steam Early Access stage and it’s not hard to see why. This is a slick, ambitious, feature-packed first-person shooter that fully exploits the HTC Vive platform’s advanced VR capabilities. The game takes place in the city of Neo-Shinjuku in the year 2271. A huge organization known as the Eden Corporation runs the world and is generally seen as a force for good. However, resistance movement SyndiK8 has discovered evidence of corruption within the corporation and the horrifying truth about their latest line of robotic products. Thus the scene is set for HTC Vive players to take on the role of SyndiK8’s top operatives and infiltrate Eden Corp in order to steal one geopbyte of important data and bring the organization to its knees. 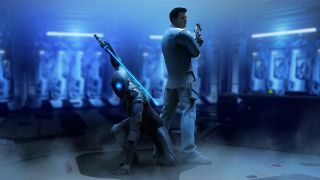 At this stage of the game’s release there are two playable characters to choose from – Bishop the gun cleric and Saija the cyber ninja – although more will become available as development progresses. These characters have an awesome arsenal of weapons and abilities. Guns, swords and projectile weapons are among the tools they wield but it’s the characters’ special abilities that make them particularly interesting. Bishop, for example, can charge weapons, dual-wield guns and trigger his bullet time like Timewarp ability. Saija, on the other hand, can fire a Shuriken Stream, throw her Katana and perform a Levitation Smash. The player’s impressive firepower is more than justified as a typical stage will see your characters occupying the central area of an arena style environment while wave after wave of murderous androids are activated and close in for the kill. On any gaming platform that scenario would sound pretty enjoyable, but thanks to Raw Data’s active VR combat the fun here is through the roof. As well as head tracking, your whole body comes into play as you whirl around on the spot to face the incoming threat. More important though are the HTC Vive’s controllers. These bring the action to life by enabling players to use their fists in hand-to-hand combat, deflect projectiles, throw grenades, engage in complex swordplay, pump shotguns… all using the physical motions that would be required to pull off such moves in the real world. In relation to first-person shooters, Raw Data represents a dramatic leap forward in physical immersion. None of this would be possible without some serious processing power driving the whole show and this is where Survios Studios’ collaboration with NVIDIA has paid dividends. NVIDIA VRWorks’ Multi-Res Shading increases framerates by up to 30% enabling the developers to make the most of particle effects, high-resolution textures, lighting and post-process effects. It also means that the game runs beautifully on lower spec systems. A game that relies so heavily on a feeling of immersion also benefits greatly from NVIDIA’s PhysX engine allowing players to experience realistic reactions and interactions when battling enemies and manipulating objects. Raw Data’s is available on Steam as an Early Access title right now for HTC Vive. A NVIDIA GeForce GTX 970 is needed to meet Raw Data’s minimum requirements while a GTX 1070 or above is recommended to get the best possible VR experience.